The first cartoon was called 'The Mouse of Tomorrow' and Terrytoons called him Super Mouse (he munches super celery, eats super soup, and bathes with super soap) But Paul Terry changed him to Mighty Mouse to stop comparisons with Superman. In many cartoons, he appears as a mysterious stranger who only reveals himself near the end to save the damsel in distress. I love "Superman" and "Mighty Mouse"..too. 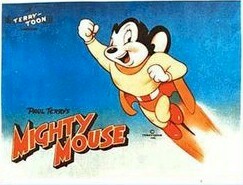 One of my favorites from childhood - I preferred Mighty Mouse over Superman.